If you're looking for the quickest path to AppExchange, you're in the right place. 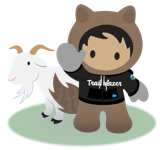 The AppExchange Trailblazer Checklist divides your partner journey into 10 steps, starting with guided learning on Trailhead and ending with a published AppExchange listing. To get started, browse the checklist to find the step that matches where you are in the journey. Then, head to the corresponding Education page. There, you'll find guidance, tips, and a list of resources to get you on your way. If you run into questions, reach out in ISV onboarding — we're happy to help. Trailhead is the fun way to learn Salesforce. Start blazing your trail with badges for AppExchange Partners. Get to know the AppExchange Partner Program, including policies, benefits, and FAQs. Meet members of the AppExchange Partner team who can help when you have questions or need advice. Learn about apps and tools to help you build your product and run your business. Apply best practices for architecture, design, and development as you create a solution on our platform. Identify a target market and document your business plan. After you submit, we'll schedule a meeting to review your business plan and product architecture. Review and sign a partnership agreement with Salesforce. Customer trust is our highest priority, so we'll review your product and make sure it meets our security standards. Publish your listing, build a customer base, and start collecting payments.